I have just finished reading Fall of Giants by Ken Follett, a superbly written historical fiction. While randomly buying this 852 pages long eBook (partly due to its very low price) I hardly knew that I have laid my hands on a gem. It is a big challenge to write a Historical Fiction based on one of the most ruthless War ever fought. Ken has a limited canvas and has to restrict his imaginative characters within the well known boundaries of hard facts. But, still he ended up doing a fantastic job. Since, the present novel is based on First World War, I imagined that the author is going to paint a grim picture of the dreaded battle, littering the narrative with blood and gore a la Red Badge of Courage. However, in the Prologue itself, I was a bit surprised as the story began in a very peaceful way in 1911 in an understated mining town, where our first protagonist William Williams is ready to make his debut as a miner, on the same day as George V is to be coronated as the King of England. The strategic beginning impressed me as it brought the ordinary and exalted at somewhat the same level. Perhaps, Coronation was as stressful and proud moment for King as the first day in deep recesses of mine, was for innocent Billy Twice. More than anything, it established an early connection between the future of Masses and Royalty very early in the story, and this connecting thread was continued throughout the novel. The story then continued in the dusty Aberowen, where I was given a close taste of Welsh life style and accents. As in any close knit town, everyone knew everyone else, their histories, their follies and their weaknesses. And, within their limited income, managed to live decently in stark contrast to lavish splendor of Ty Gwyn. Billy Twice’s sister Ethel works as a maid in the house of Earl Fitzherbert, the actual owner of Aberowen Coal Mines and a kindly yet superfluous Lord, who is too busy in pacifying his Russian Wife, Princess Bea to play any important role in the management of Coal Mines. As a result, the Aberowen folks are dependent on the shoddy tactics of greedy Perceval Jones. But, despite his apparent indifference, Fitz is a man of keen eye and worthy connections. He throws a lavish party in the honor of the King and Queen of England, inviting prominent German, French, American and Austrian Diplomats, all of whom are his friends and acquaintances. In many ways, this party at Ty Gwyn is a major episode. Here, Follett plays a masterstroke, as he introduces almost all of his fictional characters apropos the real King. Using the eloquent Walter Von Ulrich, he also expounds upon the precarious political situation of those times, where major European countries and Russia shared a strange uneasy relationship. On one hand, the Royals were relatives by marriage and blood, and on the other hand, they were hostile enemies ready to engulf each other’s territories. In such tense atmosphere, the War was an unavoidable necessity. And, then the story shifted from Aberowen to Petersburg in Russia, where masses are leading a difficult life, due to the apathy of landlords and the acute indifference by Tsar. In a way, the Russian Putilov Works is no different from the coal mining Welsh Town. And, here again we meet two prominent protagonists Lev and Grigori, both of them struggling to make a decent living and dreaming about a possible easier existence. And, they also fall in love in keeping with our story. At this point, I wondered whether Follett is not diminishing the greater events by concentrating too much on the bed room scenes of lovers, while the Universe around them is brimming with tension and turmoil. However, I was soon proved wrong as the respective affairs slide down the railing, as the inevitable World War 1 neared. Slowly, more characters were introduced, tracing the fortunes and fall of Five families – Welsh, English, American, Russian and German, set against the backdrop of First World War, Russian Revolution and German Anarchy. There is a very thin line between fact and fiction, specially in a historical novel. The events are well documented and the writer can not alter them, but to his credit, Ken Follett was able to place his fictional characters in real life situations and made them a part of History, by blending their destinies with the rise and fall of World history. Though, as I think back, I realize that the real persons did not actually converse, they were only present as a backdrop or a causative action. Though, while reading I never once noticed this. Quite a good maneuver by Follett, as he cleverly kept his fictional characters on the center stage, presenting the story from their point of view so consistently, that I was literally transported into the early 20th Century. In the beginning of 1914, when the world was still peaceful, he makes his major characters, Walter, Maud, Fitz and Ethel fall in love. They discover their passion for each other, make covert glances and end up behaving as the protagonists of any usual love story. But, as the World readies itself for a ruthless War, Ken ignited the atmosphere by making his protagonists of different nations and status err in love. Most of them wish to avoid the War so that their own lives can continue smoothly. But, nevertheless all of them get embroiled in the bloody WW I and loose peace and love of their lives, as dreaded historical events unfold from 1911 to 1924. From this point onwards, the novel becomes a true War novel, where lame excuses are fabricated for a battle, superfluous discussions are held to maintain peace and new treaties are proposed and treason exposed by Politicians for their selfish motives. It is impossible to describe the 852 pages long story in this short review, but I can assure you that it is one of the best written Historical novels. I liked War and Peace for Tolstoy’s ingenious plot, but was bored by his long philosophical monologues. I admired Wolf Hall for retelling the well known story of whimsical Henry VIII, but was irritated with Hilary’s complicated narrative. 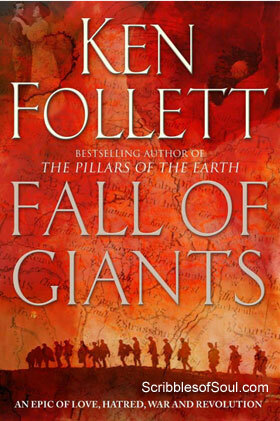 However, in Fall of Giants, I am all praises for Ken Follett’s brilliant take on one of the saddest era of History. He has chosen the period very wisely. A lot was happening on the world stage, the humanity was in grips of Revolution, Votes for Women was a hot topic and the old Dictatorial Monarchy was losing its hold and Ken makes good use of all these burning issues. Often, we find History is written by the point of view of prominent person of those times, neglecting the emotions and thoughts of masses who lived and suffered the brunt of upheaval. But, Ken has tried to give an almost equal platform to the voices of both ordinary and exalted. His characters come across as real persons, each of whom has his own share of weaknesses and strengths, and yet is able to rise above their selfish motives and contribute to the society. The Character development is the most crucial aspects of Fall of Giants, and I loved the way, their lives and attitudes underwent drastic changes, in keeping with the changing World territories. The God fearing Billy Jesus changes his role from the leader of a mine to a brave Sergeant on front lines. The honest worker Grigori, who wants to escape the cruel Russia for liberal America, takes up the cudgel to defend the honor of a village girl and ends up bringing down the cruel Tsar and yet later on grapples with the dilemma of having crowned the dictatorial Lenin as the new Royalty. In a way, he symbolized every man who has to take a tough decision and is then left alone to ponder over his judgement. But, the best portrayed character was, of course, Walter. He was the guiding voice. The writer uses him to explain the political rivalries, the futility of war, the necessity of a radical change in society and the worst sufferings that a man can undergo. He begins as a charming Gentleman, continues as a German Intelligence officer, a dedicated soldier, who is ready to defend the honor of his fatherland despite knowing the futility of War. And, ironically, in the end, he is the one who suffers the most materially, though he is rewarded with true love. While reading the novel, I was again and again impressed by Ken Follett’s easy conversational style. I wished I was taught History in such comprehensible manner, instead of being expected to cram dates and names. Also, he has explained the meaning of every Non English word/phrase/quote in a non obtrusive manner. He even gives a little background to important events and real persons, nowhere assuming that the readers would already be familiar with History. As a result, a novice like me was also able to grasp the finer nuances of World War and Russian Revolution, without being bored. I also liked the way, he kept America on sidelines of the real story, at least, initially. Since America did join War only at the very end, and that too in the manner of a condescending big brother, Ken gives a liberal yet restricted role to Gus Dewar. But, most of all, I loved the fact that his imaginary characters are wonderfully interlinked with the real persons and events. He has created an excellent saga transcending the boundaries of Nation, religion and customs. His writing style is simple yet elegant, his story based on reality yet imaginative and the execution a complex labyrinth carried out with utmost ease. In short, Fall of Giants impressed me as the best Historical Fiction I have ever read – a perfect blend of War, love, politics and revolution. If you have never read a War novel earlier, do read Fall of Giants. I am sure, like me, you would not be able to stop admiring the good writer. Hopefully I would soon read Winter of The World, the second book in the Century Trilogy by Ken Follett, where the story continues to the Second World War.